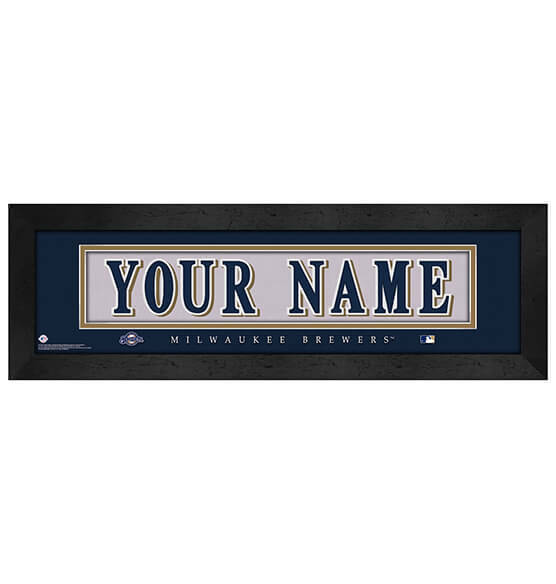 As a part of the True-Blue Brew Crew, our Milwaukee Brewers Personalized Nameplate Wall Art is one custom piece that no true fan should be without. This made-to-order print is customizable up to 12 characters — add a first name, last name or an affectionate term of endearment. This horizontal wall art comes ready to hang with a sawtooth hanger for easy mounting. It features brilliant team colors and the iconic team logo in an officially licensed print that is guaranteed to be cherished. Our Milwaukee Brewers personalized merch makes a great gift for yourself or a friend or family member who always looks forward to opening day at Miller Field.